Vice posted an editorial talking about how gaming has "taken over" Kickstarter and asks if this is a good or bad thing for the world of tabletop gaming. Climb the ladder. Slide down the chute. Score on the triple-word tile. Don’t pass go. You remember all those cardboard commandments, don’t you? Well, times have changed since you were last clad in dingy sweatpants and rolling dice in your rec room. The board games of today look extremely different from the ones you may remember growing up with. Where once your job was to bankrupt your fellow players, or be the first to go around a loop, modern board games ask their (largely adult) audience to trade wheat for sheep, to finish building a road in the city of Carcassonne, or to help the CDC fight off a global health crisis. 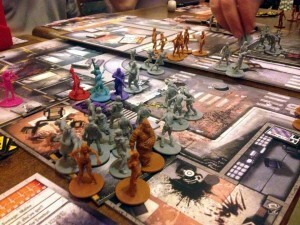 Over the past three decades, as players have matured, their board games have grown up too.